It has become a lovely tradition for me to knit all my siblings and siblings in law, parents and partner little gifts for Christmas. This year was the year of the hat! 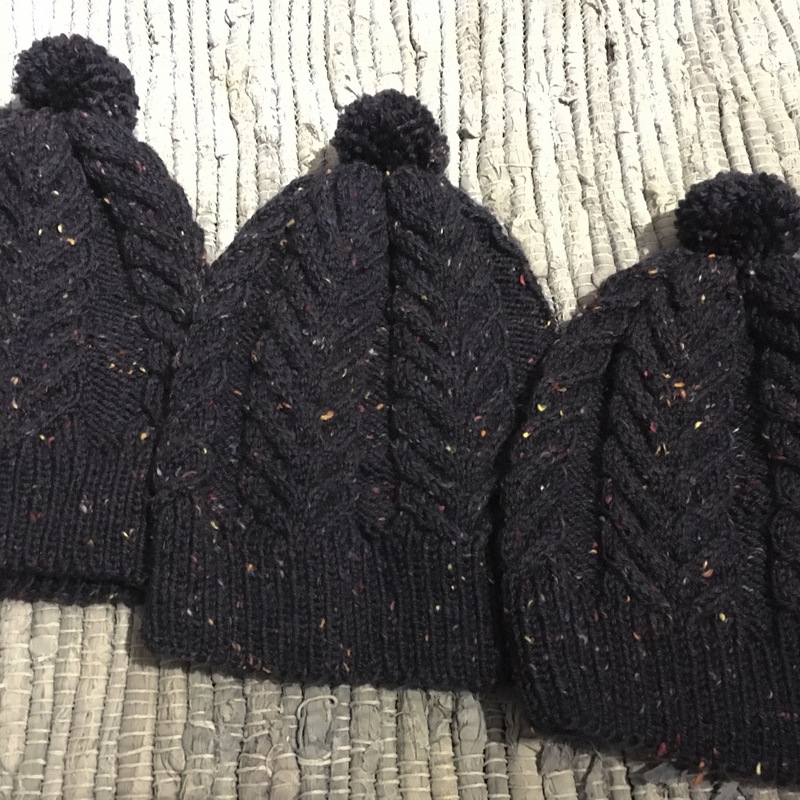 And now I’ve finally handed over the last Christmas knit, I would like to share with you all my little hats. Let’s start with the boys. This one is the Antler pattern by Tin Can Knits. I really enjoyed knitting up this pattern, it’s easy to memorise as it’s an intuitive pattern, and it’s really surprisingly simple. The blue squishy speckled goodness you see above is King Cole Fashion Aran in the colourway Skye (all of the tweeds have Scottish islands for names which I love), which, while being an acrylic superwash job, is lovely to use. You may have noticed I made my own hat out of this stuff. It comes down to my chin! The fellas really liked them… plus that’s four more Pom poms I was forced to make… it’s a hard life. Exhibit a… Fleesensee. This one has lovely branches and stripes which I will confess were very fiddly, but I love the effect. And oh look another Pom Pom! The hat came out maybe a little small to fold back the brim, but at least it won’t fly off. I actually think it looks great worn slouchy. Exhibit b… Old Garden Hat. A lovely cabled pattern which was interesting to knit and I just love. 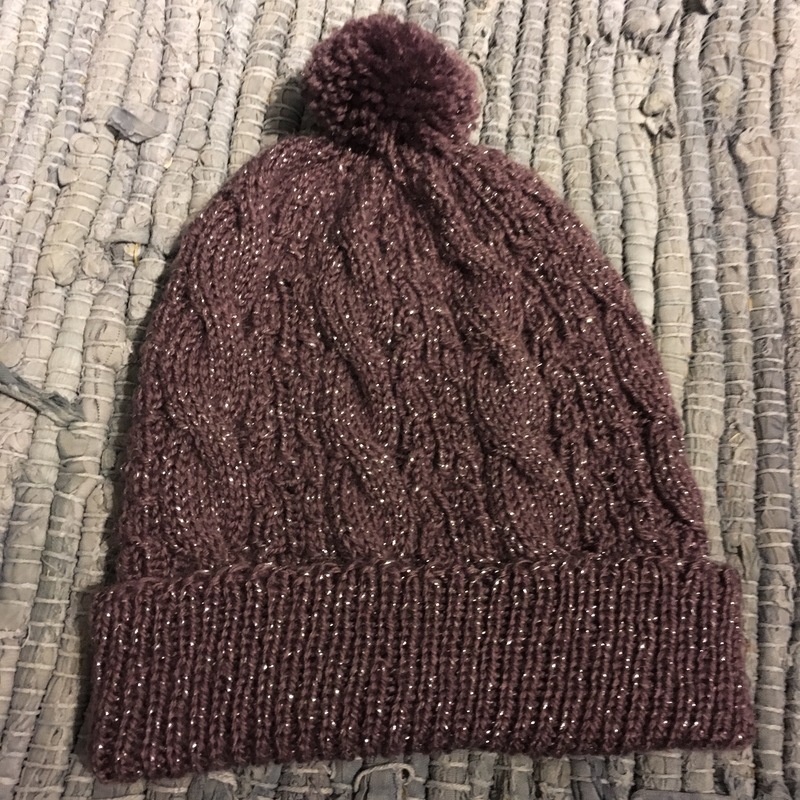 The size match is a bit better on this one and I think it looks better with the brim folded back… though it doesn’t look very exciting on the rug like this… and guess what… Pom Pom!!! And guess guess what… SPARKLY!!! 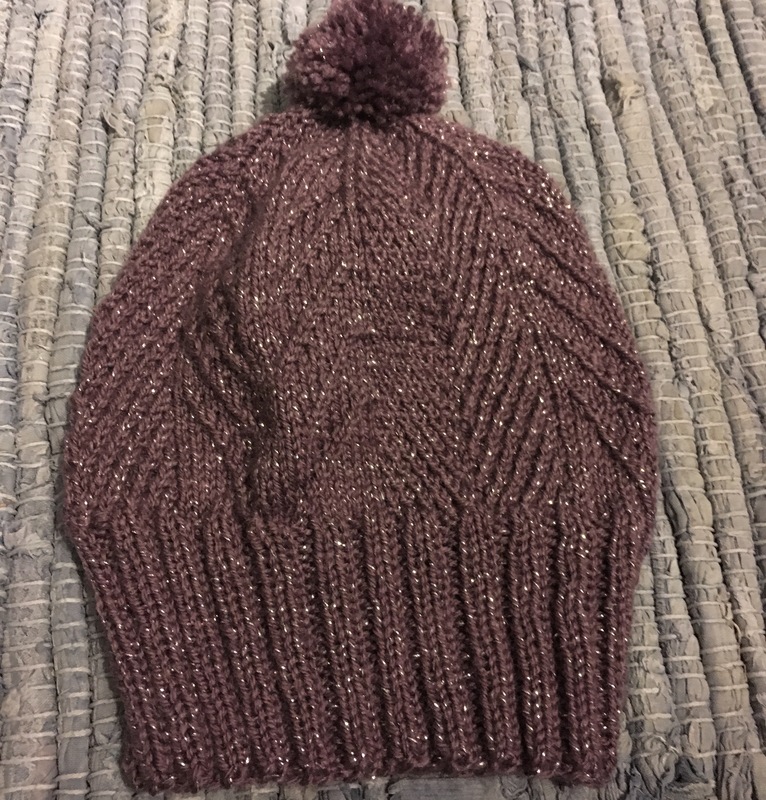 This is thanks to the James Brett Twinkle yarn in mauve colourway which I used for all of the girls stuff, and I love it so much I might need a sparkly jumper or cardigan… maybe. 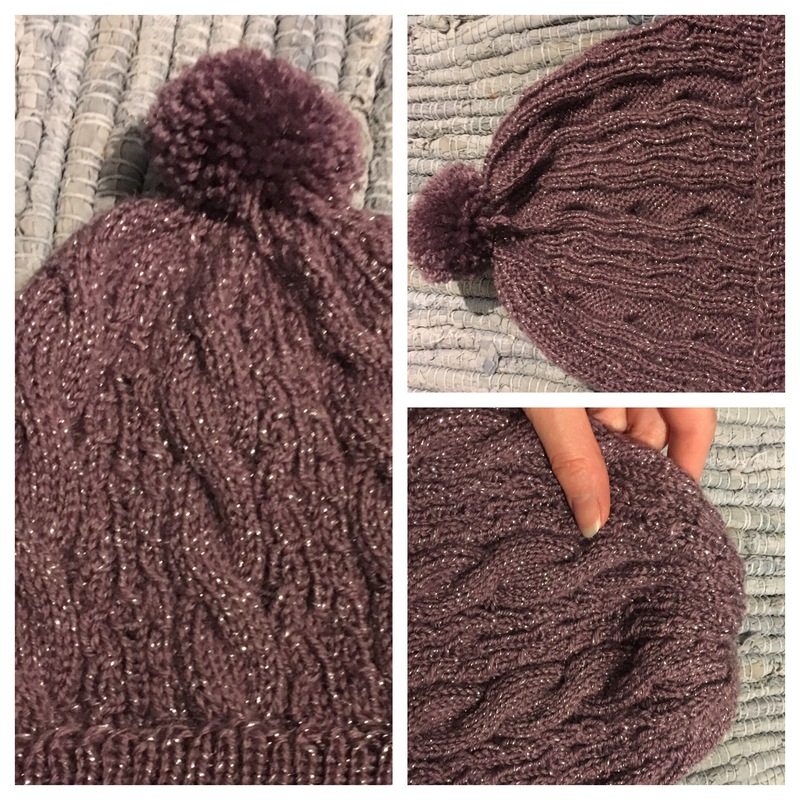 I had a bit of trouble with my Pom Pom on this one though… it’s possible that I sewed it on to the inside of the hat. This meant it needed to be cut off (those puppies are sewed on pretty damn secure).. which made me sad… but then I got to make a new one… which made me happy. Top right inside out! Bottom right Pom Pom inside! Left juuuuuuust right! 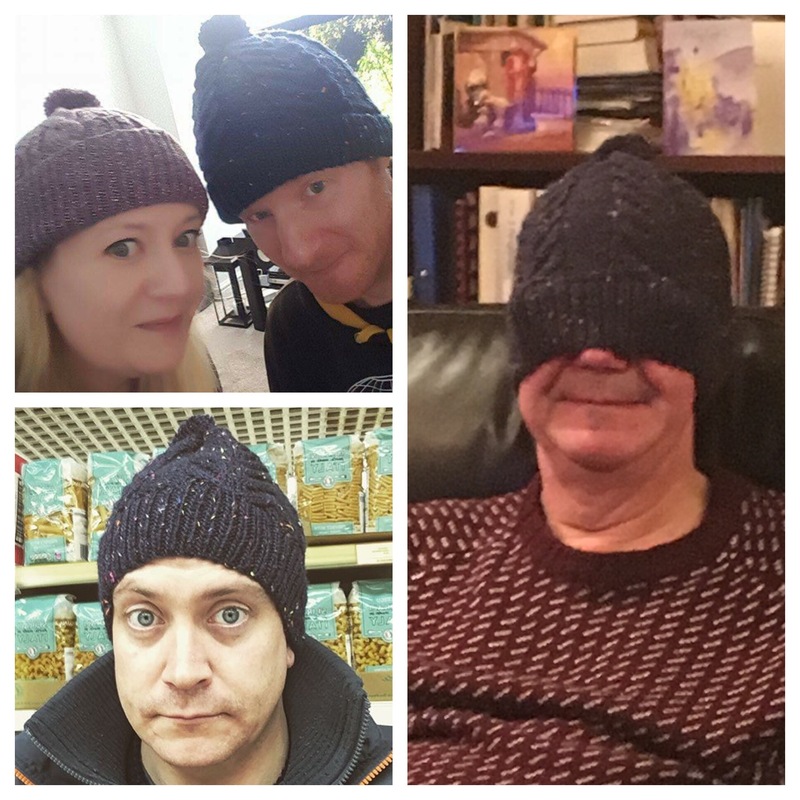 Some of the recipients even sent me photos of hats in action… this made me veeeeeeeery happy. 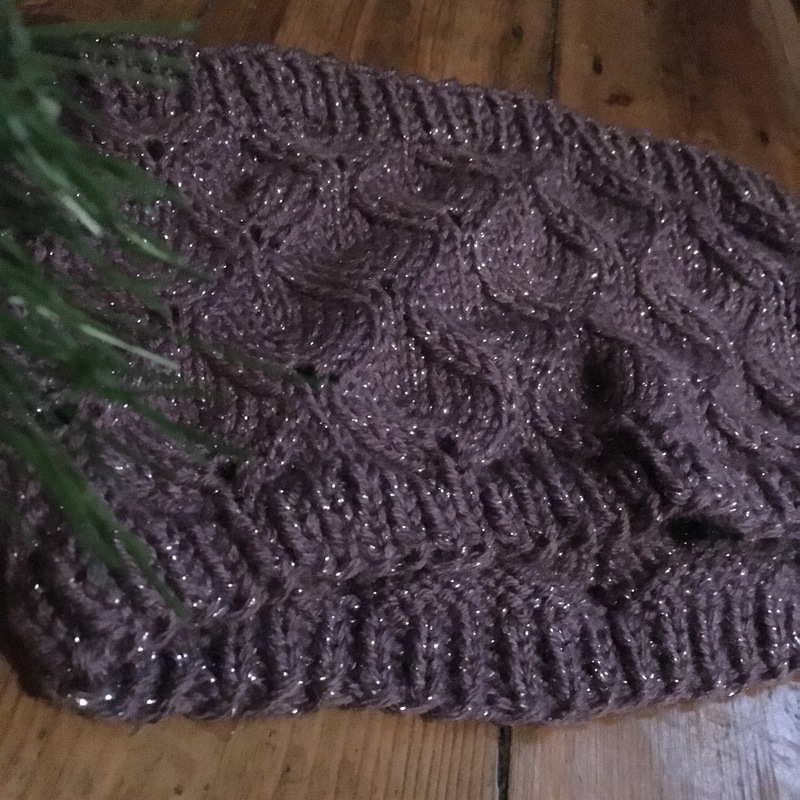 This is the cowl part of the Alna hat and cowl set by Suzanna IC. 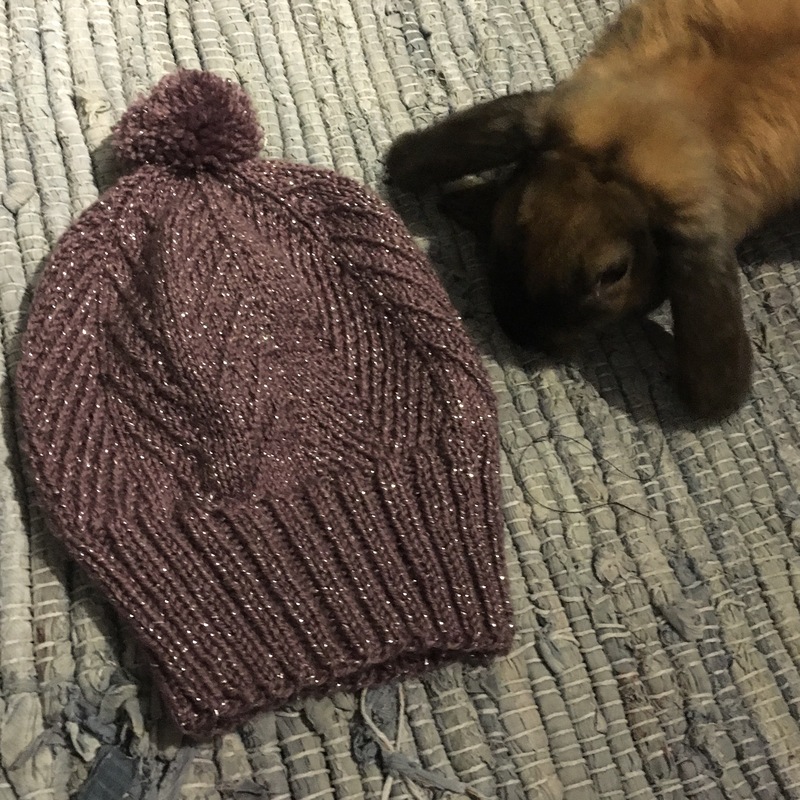 A really super quick knit, it actually asks for Aran yarn but the Twinkle is DK… so I cheated and doubled up. To get it finished in time this thing literally came everywhere with me! 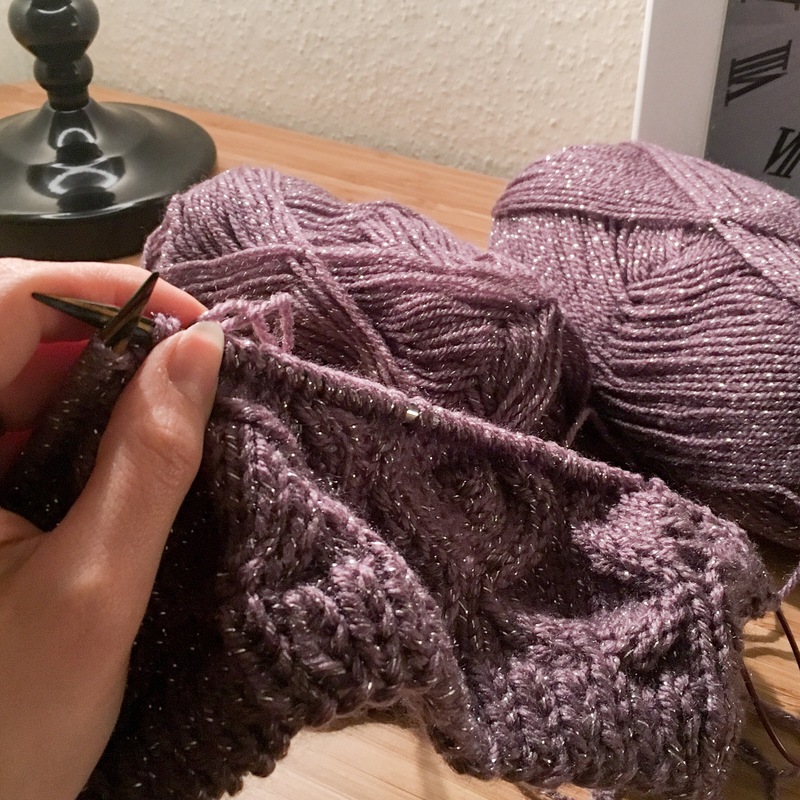 It has a lovely wave pattern which can be left unblocked or can be smoothed out… I chose the smoothed out version so that it would be softer and lie better when worn. 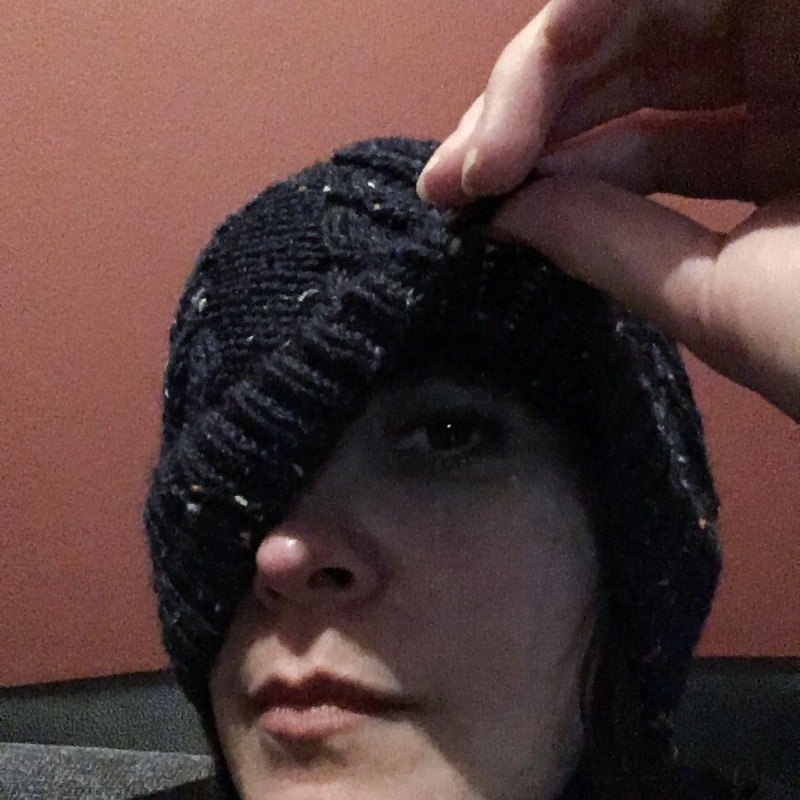 So I think that brings me up to date with all of my knitting… I have of course got plans for more hats for myself, turns out hat knitting is really satisfying! What wonderful gifts!! 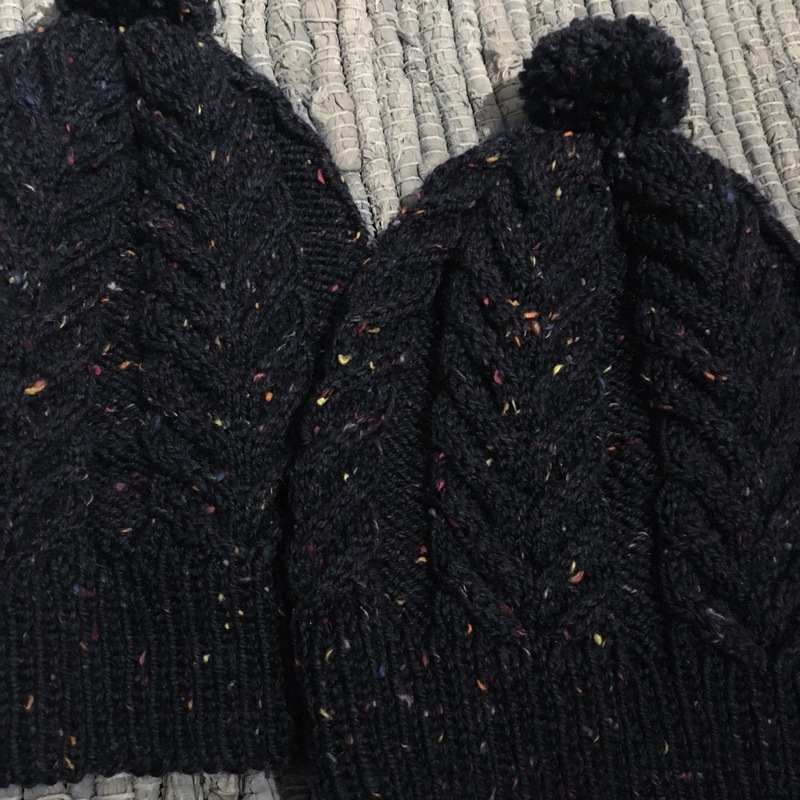 I love the tweedy yarn you used for the black hat, and they all turned out so well.